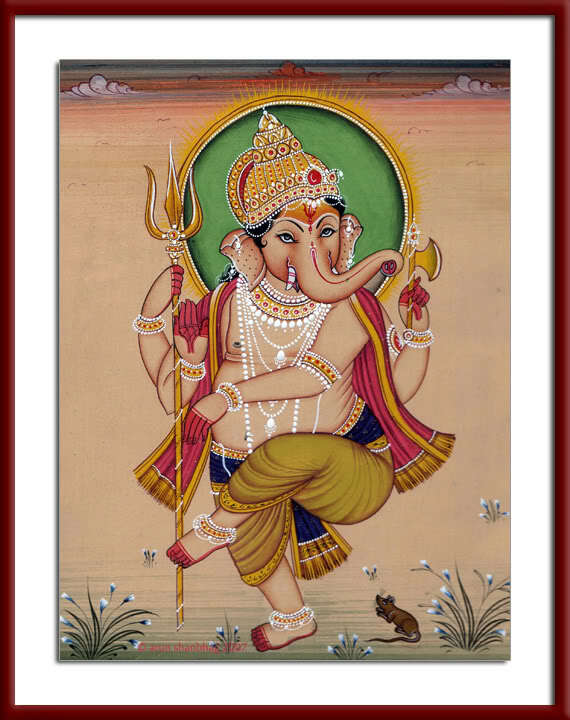 Many are familiar with the legend of Ganesha’s coming to life. Once when Shiva was away and Parvati wanted to bathe, she created a male child from the skin of her body and gave it life. She instructed the child to let no one come her way. While she bathed and the child stood guard, Shiva arrived, but was stopped by the child whom Shiva does not recognize. A fight ensued and Shiva beheads the boy and discards the head. When Parvati finds out what happened to her child, her sorrow remains inconsolable. To make amends, Shiva instructs his band of followers to bring the first head they come across. When they return with the head of an elephant, Shiva places it on the child’s body and gives it new life. Thus Ganesha, the elephant-headed god, came to be. Children are intriqued by the appearance of Ganesha and want to know: “Why does he have a trunk? Why does he have large ears?” and so on. While this hymn does not answer these questions, enlightened people over the ages have guided us to perceive the unique aspects of Ganesha’s form in a manner that is relevant to our own lives. The elephantine ears guide us to give people our full attention, particularly to our family and friends. The overly large head further guides us to reflect on what people say and to carefully judge the merits of their words. The narrow eyes caution us to focus on our surroundings and be ever watchful. The small mouth hidden behind the trunk prompts us to speak sparingly, but with clarity and truth; and the enormous stomach symbolizes our need to digest all good and bad experiences life brings our way. A rear hand holds a noose directing us to control our senses and desires; the other rear hand wields an axe, useful in severing our desires and attachments, which trap us in this materialistic world. The front right hand is always raised in blessing, in a posture called the abhaya hasta – removing fears of the unknown. Seeing such a posed hand soothes our heart, drives away worries, and reassures us that we are ever in God’s care. And despite all the challenges that come our way, he stands by us and loves us dearly, always! And finally, with his left hand presenting modaka (rice muffins), Ganesha promises us sweet fruits of our labors and ultimate peace in our spiritual quest.